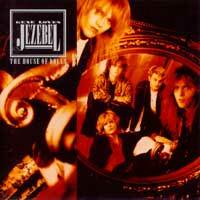 In July 1990, Gene Loves Jezebel released Kiss Of Life. This was the band’s fifth album, and almost three years on from The House Of Dolls. The sleeve notes to the album state that it was “conceived in London in the Spring and Summer of 1989” but the background to the Kiss Of Life album goes back to 1988 when The House Of Dolls was being toured around the world. Following their previous release in October 87, the band had been touring regularly but thoughts were beginning to turn towards the next project. Their record company at that time was Beggars Banquet in the UK, who licensed the band to other companies around the world. In the US, this was Geffen. 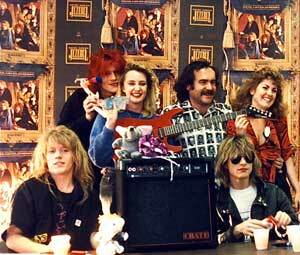 Perhaps the fact that the band had gained much more success in the US with The House Of Dolls, had resulted in a subtle leaning to capitalising on the US market – certainly from the record company and the new American management’s perspective – and that’s the direction the band were pushed in. After all it was a big market. The band had changed their management to the American-based Stiefel Phillips Entertainment, after the sacking of Gerry Hempstead (seen behind Peter in the picture below). Pete: We spent a long time reorganising after we changed management. Then the songs had to be written, which is quite a slow process for this band. James: The twins and I lived close to each other in London’s Earls Court, and Martin Mills at Beggars thought a home studio would help us compose and save him money – because we were always spending so much money on demo time. So this writing and demoing of new songs was largely done at home. 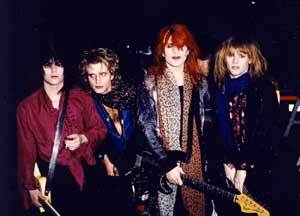 Pete: The songs were written in a similar way to the House of Dolls (usually rehearsed and then demoed at Matrix Studios in London). For the first time the band lived within walking distance of each other (I’d finally succumbed and moved to West London). We spent many nights at the pub near where Jay and James lived, so it was easy to get stuff together, either on Jay’s portastudio or in rehearsal. For varying reasons it was an unsettling time in the GLJ camp. The idea of the twins at the helm was a unique aspect and no-one sought to change that but after Michael more than once threatened to leave and even to give the South American tour a miss, only turning up at the last minute, it added to the unsettlement. Interspersed with the 1988 tours were some preliminary searches for a producer for the next album. How smoothly this goes can have an impact on how confident the band feel about the direction they envisage. They began questioning where they were heading. Pete: I remember Jay and I weren’t happy with the direction it was going and had discussed leaving the band and forming a new band. 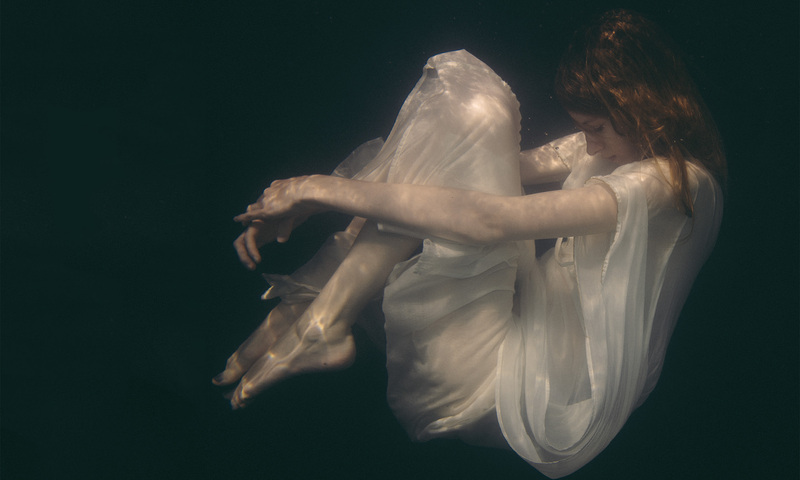 We’d been inspired, after a recent Pixies gig, to try a different approach. But they didn’t leave and what’s more had found out that James and Chris were also disillusioned, and that they all felt the same vision. Which left Michael of a different mind. It was around this time, the song Kiss Of Life appeared. 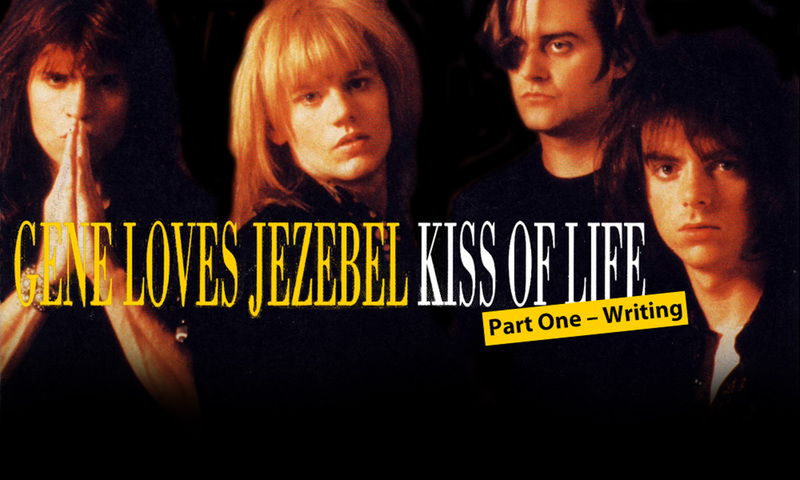 James: I had written the music to what would become Kiss Of Life – the title track of the album. I’d recorded it onto the home studio so the twins could work on it. Michael’s version didn’t work although he’d had complete access to the portastudio to work out his ideas. Meanwhile Jay had to resort to other measures. James: Jay took me into his bedroom and played me the vocal he’d put on top of my music – he’d been forced to do it on a cassette player because he couldn’t get near the home studio. It was pretty close to the vocal that went on the finished record – it was fantastic. Although pleased with the new song, things were not improving creatively in their relationship with Mike. James: About a month later Mike summoned Pete, Chris and me to a meeting in the Drayton Arms pub on Old Brompton Road and told us he was leaving. None of us fought it. So, without too much fuss, Michael was left to his decision and left the band. Perhaps he was bluffing and hoped that the band would be resolved to stay as a five-piece but after the previous threats and the ongoing differences they had, and although the rest of the band knew they would lose its unique gimmick of ‘the twins’, there was a sense of relief. Jay: Pete and I had had enough and were just about to start anew, when suddenly my brother left and we were a four-piece and everything was cool again. We always were a four-piece in truth. Pete: The fact that Michael wasn’t around didn’t seem odd because he’d missed a lot of the writing process during House Of Dolls (He spent a lot of time in LA with his girlfriend). 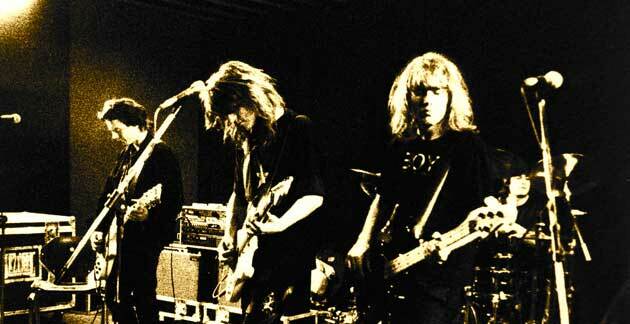 Jay: We’d wasted fortunes on demoing with the old line up and I couldn’t get near the recording set up we had in the Earls Court flat. Naturally this major line-up change led to some further questioning of the band’s identity. Pete: We wanted to change the name at that point but were persuaded by record co/management/some band members to keep it. They carried on trying other producers, such as Steve Brown, who had been the producer of Wham’s Fantastic and The Cult’s Love, with whom they recorded a couple of songs, before they finally opted for Paul Fox. 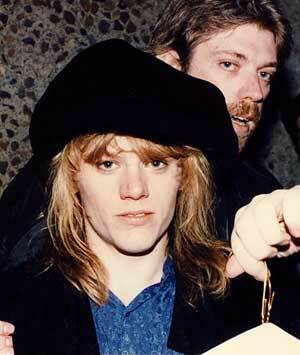 Pete: We recorded Life Without Love with Bob Rose as well as Steve Brown. We met up with John Paul Jones, he was interested in producing the band but I remember Wayne from The Mission warning us not to use him. Apparently he was very finicky and took forever programming drums. Life Without Love would go on to be recorded for the Heavenly Bodies album a couple of years later but would not be part of that album until issued as an extra track on a re-release later in the 90s. You can now find the demo of Life Without Love on the 5-CD box set. James: We went into the studio with Jimbo Barton who’d produced Rush. I actually found him very likeable – but it was a hopeless mismatch creatively – although I quite like the version of Walk Away we recorded with him. Pete: I remember he tried to get me to sound like Geddy Lee. It was a very fast version. But, the band still didn’t get things all their own way after Michael had left, even when demos were complete. Pete: After all the demos were finished the Geffen A&R man thought that some of the songs could be improved. James: Jay and I were forced (I don’t use the term lightly) to go to LA (I was very down on LA at the time) and write with “pro’ LA writers – the antithesis of what we all thought our band was about. So they sat down with the likes of Holly Knight (who had written Love Is A Battlefield among others), Marc Spiro and Alee Willis. It didn’t go well. Pete: They came back with some funny stories and a highly amusing version of Jealous but nothing musically that was remotely suitable for the band. Although James had already had doubts about Jealous anyway, Gary Gersh, Geffen’s A&R man, had insisted the song “didn’t have a chorus”. James: Marc Spiro’s “chorus’ for Jealous is one of the funniest things you will ever hear! They had not been previously worried about their song-writing and the sessions led to nothing but a shattered confidence. James: It was soul destroying – and a shockingly bad A&R decision. We wasted a month, a lot of money, and felt wretched at the end of it. I remember sitting in Holly Knight’s Bel-Air mansion looking at Jay, and realised he was too depressed to even speak! Let alone sing. 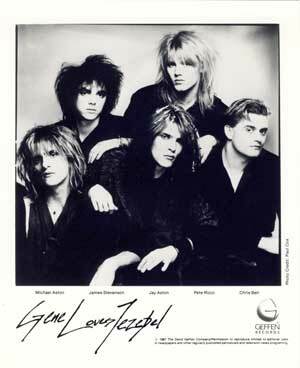 At last though, Gene Loves Jezebel, now a four-piece, could head into the studio to record their follow-up to The House Of Dolls with producer Paul Fox. In Part Two of this Kiss Of Life story, you can read about what happened at this next stage in the process. James, Michael, Jay and Peter before they performed on the MTV New Years Eve show, December 1987. Instore record signing for The House Of Dolls at Huntington Beach. Pete: I used to like doing ‘instore’ record signings as we would always get loads of cassettes and tell the record shop to send the bill to Geffen. 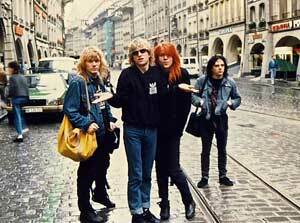 Peter, Michael, Jay and James lost in Bern, Switzerland while promoting The House of Dolls through Europe, November 1987. Pete: We took the train from Milan to Paris and got searched as we were leaving Italy. Our tour manager ‘Wes’ had a pot pipe on him so they dragged us off the train and interrogated us. They let us go when they found out we’d played on Silvio Berlusconi’s tv channel. It was some crappy day time show, where we mimed Motion of Love in front of a ridiculous carousel and an audience of OAP’s. Couldn’t keep a straight face. Anyway the train had long gone, with an unsuspecting Chris Bell on board, he’d escaped to a quiet coach to read. He didn’t have a clue what had happened to us. When he got to Paris our French publisher took him to an expensive restaurant. We took the slow route via Bern and finally got to Paris at midnite, very hungry and pissed off at our tour manager. Publicity photo for The House Of Dolls. 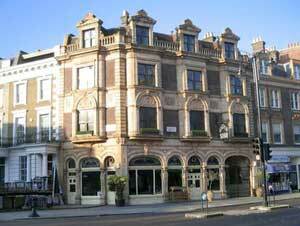 The Drayton Arms pub, Old Brompton Road, London.